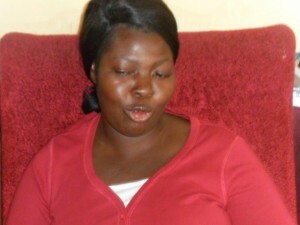 I first became ill in 2007 when I was living with my husband in Kwekwe. I thought I was suffering from a heart problem, and the doctors gave me some pills. But they didn’t work – in fact they made me feel worse. I decided to call my parents and asked them to take me to a clinic. Tests and X-Rays that were done that day showed that I was suffering from T.B – so I had been taking the wrong medication. While we were at the clinic – my mother and sister insisted that I should go for HIV testing – and I tested positive. The doctor gave me medication to treat the T.B and I went home, back to my husband. I didn’t disclose my status to him – and after a while I stopped taking my TB tablets, thinking that I was cured. A few weeks later, I got sick again and had to go back to the clinic. My T.B. was back. The clinic gave me the same tablets. Telling me to take them all this time. I was even more afraid to let my husband know my status – so I didn’t go home. Instead I traveled to Harare to try and find a job. My husband followed me; insisting that I should go back home to be with him. But I was so ashamed that I refused. I told him I “was not worth because I was HIV positive”. He wouldn’t leave me. He told me that he accepted and loved me regardless of my HIV status. I was so shocked – I had not expected him to say this to me. I am now 30 years old and I recently started taking ARVs, I feel fit and well and I am looking hard for a job to do. I am a Positive Hero – I can do anything.